The Cabrera National Park is to the south of Mallorca and is made up of 19 small islands and isles with an area of 1,318 hectares on land, as well as the sea area that surrounds them, with a maritime area of 8,703 hectares. The first island to be found, after about one hour's boat trip to the south from Colònia de Sant Jordi or Portopetro, is Na Foradada, where there is one of the three lighthouses of the archipelago. Following on come S'Illot Pla, Na Pobra, Na Plana and L'Esponja, a group of small isles that come before the Island of Conills, the second largest land mass of the archipelago, and Na Redona, a small island more to the south and nearest to the largest island: Cabrera. The natural port of Cabrera is the arrival point for the island. The Port is found to the north east of the island and the Cap de Llebeig and its lighthouse are the references for the boats that wish to enter the harbour. The silhouette of the castle of Cabrera on a hill, the picturesque quay area, the beach and the transparent water with so many different hues, are the characteristics that make the best natural refuge of the island an extraordinarily attractive site. To go to Cabrera with one's own boat, a navigation permit needs to be requested from the administration of the Park, and if one wishes to anchor and spend the night in the harbour, an anchoring permit must be requested. This is limited to 50 boats per day, with a maximum stay of between one and seven nights according to the time of year. Anchoring can be carried out by using a system of buoys to protect the fields of posidonia in the area of the harbour. Another way of getting to know Cabrera is with one of the tourist boats that leave from the port of Colònia de Sant Jordi and from Portopetro during the summer months. This visits are limited to a maximum of 200 people per day, except in August when this is extended to 300 per day. The trip permits visiting the quay area, the beach, the castle, the museum and the monument to the French prisoners, amongst other places of interest. On the return trip, the boats enter Sa Cova Blava (the blue cave) and travellers may swim in this spectacular place that has an extraordinary light. Children from the Illes Balears and Pitiüses of school age can visit Cabrera subsidised via the educational environment programme "Descobrir Cabrera" that each year the National Park makes available to schools. 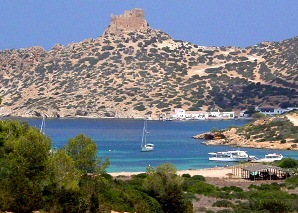 Cabrera is a paradise for deepsea divers with two reserved areas, Cala Galiota and Es Dimoni, where diving can be practised. All the natural resources are protected and so sports fishing is not allowed, nor hunting, nor the collection of natural products no the extraction of any minerals. The animals and plants that live in the archipelago of Cabrera have evolved slightly differently depending on the singular environmental conditions of each island, and their own endemic varieties and breeds have appeared. This is the case of the lizard (Podarcis lilfordi), of which there are at present ten endemic subspecies exclusive to the different islands. The marine birds, such as the Balearic shearwater (Puffinus mauretanicus), the Audouin's gull (Larus audouinii), the Cory's shearwater (Calonectris diomedea) and the Shag (Phalacrocorax aristotelis); and the birds of prey such as the Osprey (Pandion haliaetus), the Eleonora's Falcon (Falco eleonorae) and the The Peregrine Falcon (Falco peregrinus), are one of the most important natural values of the park, to which over 130 species of migrating birds must be added. The most characteristic vegetation of Cabrera is the low hills of wild olives (Olea europea silvestris) and Junipers (Juniperus phoenicea), although there are also some extensive pine areas.